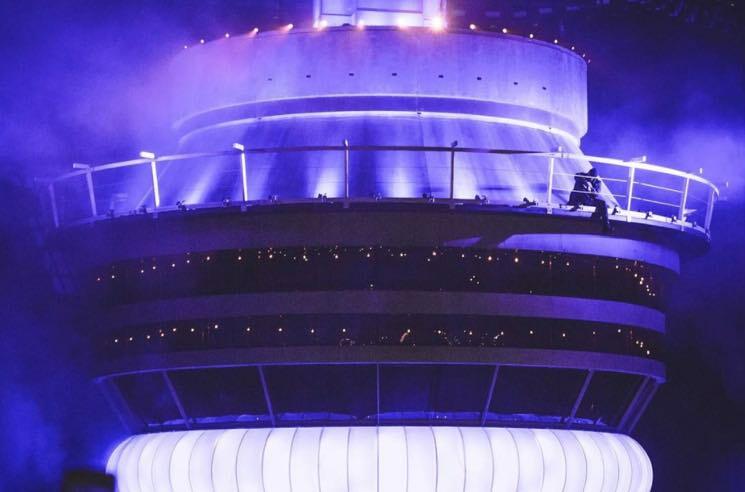 The highlight of Drake's eighth annual OVO Fest earlier this week might not have been his star-studded guest list or even the man himself, but the gigantic replica CN Tower that dominated the stage that evening. After Drake admitted it took 20 calls to find a company that would build the massive replica for him, the question remained: how did it all come together? The company tasked with recreating Drake's VIEWS cover art was Las Vegas-based company Show Group Production Services (SGPS), who designed the set piece in a single weekend based on a scaled reference and photography of the tower provided by the rapper's team. SGPS then worked around the clock to bring it into existence. "They came up with the concept of the design for this show rather late," SGPS owner Eric Pearce told the CBC. "It's pretty large. We didn't have time to make any models. We simply looked at photographs." Pearce told the broadcaster that a replica that size would normally take six to eight weeks to build, as opposed to the three they completed it in. Reportedly "two or three times" larger than a traditional rock setpiece, it required five tractor-trailers to ship the pieces over the border for setup at Toronto's Budweiser Stage under the guidance of an SGPS team. SGPS, who have also handled tour production for Justin Bieber, Roger Waters and Guns N' Roses, will now keep the tower in storage since it's too big for "conventional touring." Pearce declined to say how much it cost to build or whether or not their tight schedule was worth its one night onstage, though any OVO Fest 8 attendee would certainly feel it was. During OVO Fest, Drake also took time out of the fest to hint at a new album being recorded on home turf. Pick up VIEWS on vinyl via Umusic.